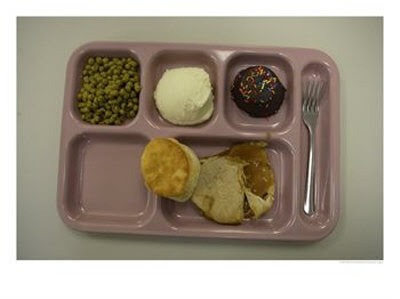 Contents: Peas, mashed potatoes, cake with sprinkles, a biscuit and beef pot pie. Notes: Oh my this looks awful. The only thing that might be any good is the biscuit. Blerg. And those peas look like those nasty sweet peas from a can. You can tell by the baby-poo green color. I love fresh peas or even frozen peas but sweet canned peas make me gaggy. Yeah, they are anything but fresh.